Talk about challenge? Every day of their lives is a challenge. Just getting up in the morning and remembering where they are is challenging. Having their arms do what their brains are telling them is another difficulty. Some must move onto a wheel chair or strain to gain full height to use a walker. Diabetes, Parkinson’s, brain damage, stroke recovery, and Alzheimer’s are common among them. Most led a “perfectly normal life” until an automobile accident, stroke, brain seizure, paralysis, heart attack, fall, or serious disease invaded, and drastically changed, their individual worlds. Others were born with Downs syndrome or other developmental disorders; some are older adults who “…just want to hang in there.” Several want to get back to “my real life.” These are the clients of the RIO Center, survivors, courageous individuals to whom social interaction, health, cognitive and physical abilities are so very precious. 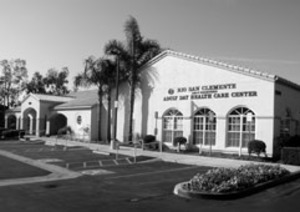 San Clemente’s RIO Center is located high on a hill, off Calle Frontera, adjacent to the Methodist Church, and directly north of San Clemente High School. The former Leo F. Fessenden Adult Day Health Center, it is an attractive, white-stuccoed, one-story building housing a large community room, boutique shop, exercise area, an executive meeting space and staff offices. Upon entering there’s a large, attention-getting aquarium with exotic, colorful fish; the ever-smiling Yelba Guadamuz greets you at the reception desk. The outside patio provides an appealing view of the ocean and surrounding community. Additionally, the Center opens its doors for community group meetings, church activities on Sundays, and houses San Clemente’s Senior Net Cyber Café. Sixty-five clients are enrolled at RIO, 35 to 40 of them attending three to five days per week. They stay from two months to 15 years. To some, the first day at the Center is like going to kindergarten. The caregiver doesn’t want to let go; the client is apprehensive. They fear change, the unknown. However, once there, the friendliness and warmth of the other clients and the caring staff win the newcomer over. Within a week, instead of “I don’t want to go,” the person is looking forward to it. The cost for services is $72 per day; MediCal provides coverage for some; grants are available for others. The clients’ caregivers, including wives, husbands, daughters, sons, and good friends also benefit greatly from RIO’s presence. They’re provided the freedom to tend to their own lives and responsibilities, knowing their loved ones are in good, trusted hands. They, too, receive counseling and Center support for their own important roles. Most of the clients live “at home” with spouses or relatives; others reside in board and care homes. They’re driven to the Center by caregivers or transported by OCTA, whose gentle and compassionate drivers are important members of the large Center family. Each client has a comprehensive, continuously updated record including documented activities and conditions about health and social needs; occupational, physical, and speech therapies and living arrangements. A multidisciplinary team, including the primary physician, monitors their progress. The caring and responsive staff of ten includes the key players of activity coordinator, occupational therapist, physical therapist, speech therapist and social worker. An on-duty nurse and program aides round out the Center’s team. Activity Coordinator Shelle Wood, who is responsible for coordinating the multiple daily events and involved staff, reported, “We want to keep our clients out of nursing homes and help them function on their own as much as possible.” The nurse deals with medical matters and the therapists tend to their respective specialties. Occupational therapy, rather than relating merely to job preparation, helps individuals meet the overall demands of their particular working, social, personal and domestic environment, and to participate in life in its fullest sense. It’s a therapy that helps clients cope with life. Physical therapy provides rehabilitation for congenital and acquired disabilities resulting from injury or disease. The physical therapist, with the help of aides, administers group and individual exercise and therapeutic massage, including corrective treatment with a number of mechanical devices. In the exercise room, the physical therapist and her assistants are busy with individual clients performing their daily exercises or receiving therapeutic massages. There are mats for stretching muscles and knee bending, several standing bikes, a treadmill, peddling machine; a parallel bar for marching and walking, and a wall-mounted shoulder exercise wheel, the best of modern technology. There’s even a computer balancing measurement machine. A typical day begins informally at 8:30 am with a balanced breakfast and socializing with Center friends or staff. Almost like an adult classroom, clients have their own favorite seats and fellow clients (predominantly women) with whom to visit over breakfast. At 9:30 am, current events, introductions to the day’s highlights, trivia games, or reviewing the previous week are collectively discussed. At 10, group physical activity is emphasized which may include balloon volleyball, a favorite of many, or stretching and practicing calisthenics from a chair or standing position. These “range of motion” ROM exercises are conducted as enjoyable and fun-filled physical experiences. At 11, the physical, occupational, or speech therapist, or program coordinator conducts group programs. They may include guessing trivia answers, discovering hidden pictures, solving word puzzles, or working on crosswords; full participation is encouraged. At noon, a tasteful reduced sodium, fat, and sugar lunch is served. Each day introduces a different menu, ranging from beefsteak-mashed potatoes, lima beans, and pineapple chunks on Monday to baked chicken, broccoli, beets, and fresh fruit on Friday. More social interaction occurs, often with musical accompaniment. At one, there might be a Bingo game, or a group discussion about health issues. There may be entertainment, featuring a trained dog, the weekly visiting band, a pianist for “sing-alongs,” or a craft session such as Christmas card making or collage or clay, trivial pursuit, a reading session, a pool game for men, or a manicuring or cooking class. Individuals may want to play checkers or solitaire. Often, especially on holidays, the San Clemente Jr. Women’s Club and their children might conduct a Halloween costume parade or bring birthday presents and cake for the celebrants of the month. Or a song session by the Boys’ or Girls’ Scouts, a visit by a member of the community’s gardening club, or even a movie may be on the agenda. The patio is also used for a variety of endeavors such as gardening, relaxing, or painting the scenery. Throughout the day, clients are invited to the exercise room to conduct their individual routines, taken on a walk around the premises, or they meet with one of the therapists or staff regarding a specific topic. At 2 pm, the Center settles down with snacks and more socialization, as busses and caregivers arrive to collect their valuable passengers. The day ends around 3 pm; the Center closes at 4. Two of the clients, including one long time San Clemente citizen, have become close friends over the year they’ve been in daily residence. They agreed, “This is a great place. We’ve met people we’d never have known before, and the staff is just terrific.” That pretty well says it all for the rest of the RIO’s clientele.